Our passion for results drives a deeper assessment, beyond systems and behavior. 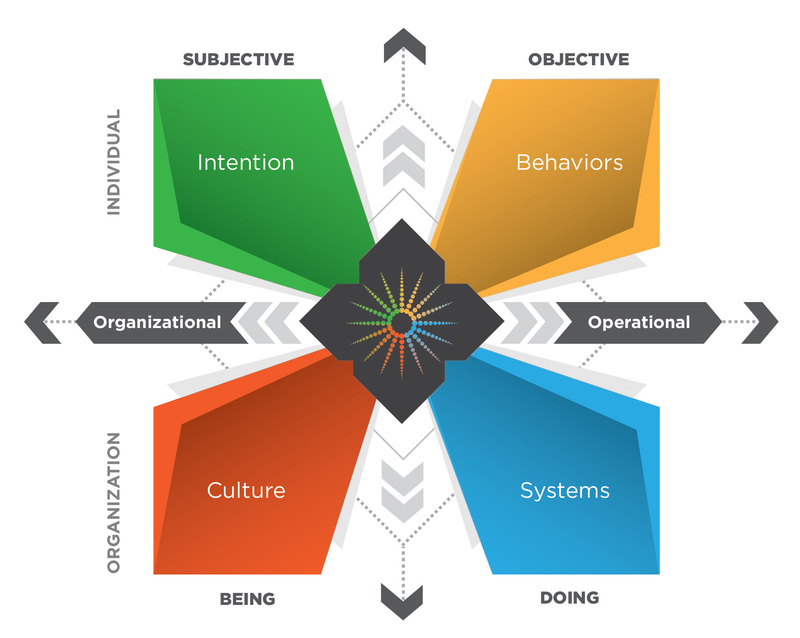 Unlike other performance management consultants, the Sinclair Group assesses its clients’ organizations through the unique lens of our InsightIQ™ model*, and the structured study of its four quadrants: individual intention, organizational culture, individual behaviors and operational systems. *Model adapted from Ken Wilber’s integral theory. Rather than limiting our focus to the traditional areas of behaviors and systems, we evaluate businesses holistically, including thoughtful observation of individual intention and culture. We believe that a balanced view, rather than prioritizing the organizational or operational side of our model, enables a fresh perspective that fuels the generation of new ideas. Our approach treats all four quadrants as interdependent and contingent upon each other—we harness the sweet spot of their intersection—where insights to the extraordinary are revealed. By leveraging our robust real-world operational experience, and the fresh perspective gained from the InsightIQ™ model, we generate insightful thinking that enables design of powerful transformation plans. Results-driven and passionate about client success, our 5-phase transformation process is proprietary, proven and repeatable—delivering profitability, predictability and performance. Because we balance the four quadrants during assessment, planning, solution design, implementation and training, together with our clients we achieve extraordinary results and powerful transformation that is truly sustainable. The Sinclair Group engages our InsightIQ™ methodology to deliver real, measurable and practical results that directly impact bottom-line performance. While the areas of behavior, culture, systems and business drivers have long been a part of the improvement focus, we have discovered the unique interdependency and contingency those key areas have on each other and how work gets done. By taking the information within these areas it provides Sinclair Group unparalleled insight into a deeper and more profound understanding of our clients’ business and performance breakthrough opportunities. We examine the four quadrants of individual intention, organizational culture, individual behaviors and operational systems—and assess their correlation to optimizing efficiency, profitability, and safety. By studying each quadrant, and how they intersect and relate, we are able to identify gaps and opportunities. These insights enable the design and execution of superior transformation plans that achieve extraordinary and sustainable results our clients never thought possible.